At Ivanco, Inc. we serve the needs of clients all across the area whose safety and security needs vary greatly according to their size and their function. But one commonality they all share is the need for reliable, rugged devices for communication in the event of an emergency. Add to that their dependency on mass notification systems for relaying messages central to their daily function, and we at Ivanco, Inc. recognize that supplying them with the very best rugged devices and technologically advanced products available is essential. For that reason, we proudly and confidently offer Telecor AssureCom systems that meet their specific needs. No matter the size of the property coverage area or the components our clients choose to create their mass notification system, each and every part of that system must always be rugged enough to withstand various changes in weather as well as any attempts at tampering. For that reason, the Telecor ICS-2 series security intercom stations are specifically and meticulously designed to function in harsh institutional environments where tamper-proof, rugged devices are vital. These units function in accord with all Telecor communication systems as well as accommodating other 25v intercom systems that utilize contact-closure to initiate call-ins. Made of 11-gauge stainless steel with a damage-resistant finish, the station’s faceplate is stud-welded and covers the system’s speaker assembly, further protecting it from access by any damaging foreign objects by a metal barrier. The speaker cone’s Mylar fabrication makes it fully resistant to destruction by liquids. Much like the ICS-2, the ICS-2A version varies only in that it also has a call switch assembly for the initiation of calls to the Control Console. Welded studs connect the call switch assembly to the faceplate, and a rugged metal actuator triggers a momentary contact switch equipped with a mechanical stop that limits movement, which in turn prevents damage to the switch mechanism. The ICS-2M combines the features of the ICS-2A with the notable addition of a large 1-1/2″ mushroom-style actuator instead of the 1/2″ flush-mounted actuator typically used by the ICS-2A. Both are fabricated of solid metal, which maximizes the strength and durability of these rugged devices. 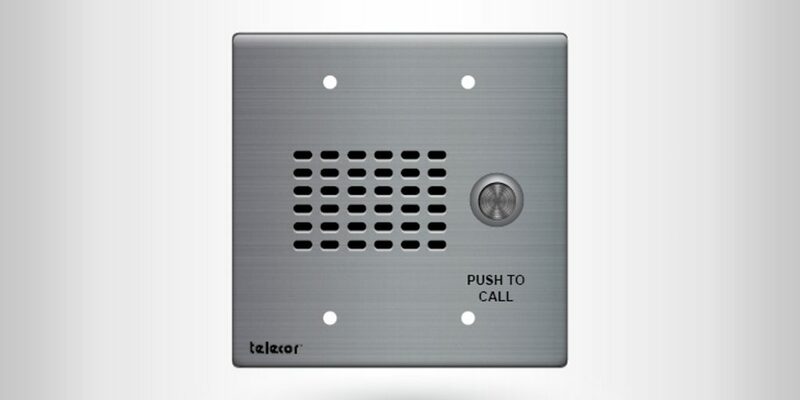 Regardless of the specific option chosen, each version of Telecor’s ICS-2 series of mass notification intercom stations mount with tamper-proof hardware onto standard two-gang electrical boxes. At Ivanco, Inc. we make our clients’ safety and security needs a priority by installing rugged devices and only the highest quality mass notification systems. We have full confidence in the superiority of the rugged devices used in Telecor AssureCom’s ICS-2 series security intercom stations. As a company solely created for the purpose of designing rugged devices of the highest caliber, Telecor has a reputation for reliability and innovative technology that gives us confidence in installing them for our clients. Naturally, our uppermost goal is keeping our clients and their businesses safe during times of crisis as accommodating their day-to-day communication needs. The security intercom stations offered by Telecor enable us to accomplish that. In our years of installing quality custom commercial security and business security systems for clients throughout Northwest Florida and the surrounding region, our reputation has always offered confidence in the fact that we use only the very best products and provide the highest degree of service in all that we do. Call the team of security experts at Ivanco, Inc. to learn more about the rugged devices we offer today!